From left John Byrne, Kurt Stegbauer, Peter Hulme Jones and Col Rava. 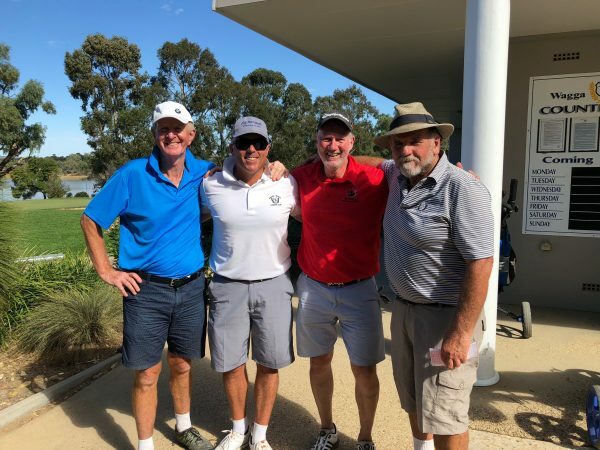 The regular Wednesday’s members’ competition at Wagga Wagga Country Club (in the Riverina region of NSW) saw one of golf’s magical numbers scored on April 4, as Head Professional Kurt Stegbauer, played the best round of his life en route to shooting a 10-under-par 59. Thanks to a morning of meetings at work, Stegbauer didn’t have time for a warm up, only arriving on the tee just as his playing partners were teeing off. Undeterred, he hit the ground running with six straight birdies, a par on the 7th and then a birdie on holes 8 and 9 to turn 8-under for the front 9 holes. When asked if he knew at the time that he was on track for the magical number, Stegbauer said “No. I got it to 10-under with a birdie on the 17th hole and knew I was 10-under but wasn’t thinking of the actual score”. Some pointed out that such a prodigious round would have been ideal for the Ron Crouch Wagga Pro-Am, held five days earlier, but golf is just one of those games where you can’t predict exactly how your day will go. “I had prepared well for the Pro-Am but it just didn’t click. I spent some time with Craig Parry and he gave me some great tips which I applied for the Wednesday’s round and it certainly helped” said Stegbauer. Stegbauer reports that since the extraordinary game some Club members have been referring to him as ‘Mr 59’. It’s great to see a Club Professional out playing with the members as it allows the Pro to showcase their skills and helps to improve the members’ games at the same time. So what’s next for Stegbauer?